As we hit these days of summer heat (mid-August), I find that I don’t want to do anything in my kitchen except…refill my ice tea glass. It’s just too hot to steam up the kitchen with a canner, isn’t it? And another issue is that this summer heat also gives my garden one last big push to finish up and create a bountiful harvest. In other words, I’m sitting here sweating while looking at a bumper crop of food that needs canning! So this week, I have tomatoes and cucumbers galore but I am putting them up WITHOUT canning. I wrote about what to do with a bumper crop of tomatoes in a post last week. And today, I wanted to give you another COOL preservation option – but for any delicious cucumbers you might have. The answer to our problem is…a Refrigerator Pickle! If you would rather LISTEN to this info, head over to this week’s podcast episode. Otherwise, keep reading while I give you the same tips below that I spoke about in the podcast. A refrigerator pickle is basically a quick pickle that is NOT canned up to be stored on the pantry shelf. Instead, it is made up and stored in the refrigerator to be eaten right away. Why is it called a quick pickle? Well, aside from being “quick” (ha ha), it is a pickle that is not fermented. It is preserved using vinegar. 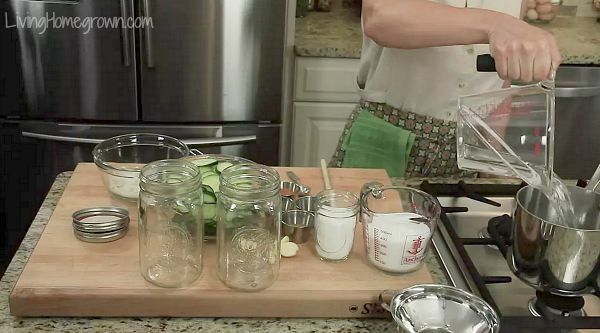 A quick pickle is made with produce that is submerged in vinegar, spices and sometimes sugar/salt. But the vinegar is the main thing that is preserving it. 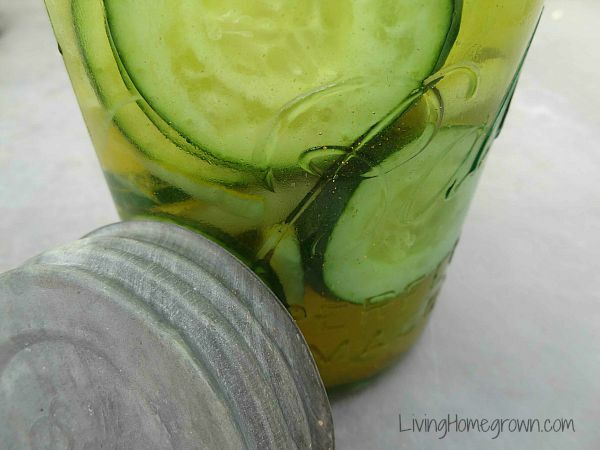 You can make and can up quick pickles and they are delicious, fast and simple. A refrigerator pickle is the same thing — but without the canning up part. This makes it perfect for hot summer days when you don’t want to pull out the waterbath canner and steam up your kitchen! Before we dive into the recipe, I wanted to give you some tips for getting the best pickle possible. Most of these tips can also be applied to other pickle making as well. 1) Which Cucumber? : Not all cucumbers make a good pickle. Look for (or grow) the traditional knobby varieties that say “pickling” in their name. These stay firm and have the best flavor. Avoid the smooth-skinned “Burpless” or salad cucumbers as they can get mushy when pickled. 2) Unblemished: For best results, use produce that is unblemished. Save the bruised or damaged produce for other things (relish, your salad, etc). In a pickle, damage not only affects how it looks. Those damaged areas are more likely to get soft and mushy – messing up your texture. 3) Freshness: The best secret to a great pickle is to create it immediately after harvest. Every day you wait, you lose some of that crisp crunch that everyone wants. For best results, pickle your produce within 24 hours of harvest. That is why using homegrown or farmer’s market cucumbers is so great – You know they are fresh. Of course, this is not always possible. But if you grow it yourself, a pickle made on harvest day is awesome! 4) Remove Blossom End: The blossom end of the cucumber (the end opposite from the stem) has an enzyme that can cause a pickle to get mushy. Always discard it. 5) Salt: Use pickling or Kosher salt when making any pickle. Regular, iodized salt has anti-caking agents that will make the brine cloudy. (Pickling and most Kosher salt do not.) If you can’t find pickling salt, you can use ordinary salt and still be safe. However, the mixture will be cloudy and have sediment at the bottom of the jar. Note: Be sure to read the label on the Kosher salts. Some brands do contain other ingredients. A good Kosher salt only has salt – nothing else. Here is a link for more info on pickling salt. 6) Vinegar: Always use vinegar of at least 5% acidity. Do not use homemade vinegar or a vinegar of unknown acidity or you cannot be sure of the shelf life or safety. Don’t reduce the vinegar in a recipe. If you want a less sour product, add more sugar rather than dilute the vinegar. 7) Spices: You can change out spices to make the preserves your own. It is totally safe to do that. Just don’t change the vinegar (or salt in a regular pickle recipe) because that affects the safety. The longer the spices sit in the jar, the stronger the flavor in the produce. 8) Sugar: The sugar in most quick pickle recipes is for flavor (reducing the sour flavor of the vinegar) and also to help retain the plumpness and firmness of the pickle. You can reduce the sugar and still be safe, but it may change the texture of your pickle and make the flavor more tart. 9) No Firming Agents: I do not use firming agents in my quick pickles because I find that if I use fresh picked produce and a well tested recipe, they are not needed. 10) Vintage jars: Because a refrigerator pickle is not “canned” or processed, you have an opportunity here to use vintage jars or those otherwise not suitable for the canner. Nothing makes a pickle more special than being pulled from an old, vintage blue canning jar or one with an old wire-bale lid. If you collect those type of jars, use them here and enjoy them. I have posted the full recipe for my favorite refrigerator Bread N’ Butter Pickle over in the show notes for Podcast Episode #20. Click here to get the recipe. It is a fantastic way to get home canned pickle flavors without actually canning. Have you ever made a refrigerator pickle? Is there anything else you would like to learn about pickling? Loved the podcast, thank you for the recipes. I love your site and podcasts. Very helpful and inspirational. Hi Theresa, I’ve tried two different techniques for pickling. One, instructs to keep the prepared cucumbers packed in ice anywhere from two to four hours before being packed in the jar and receiving the hot spiced brine (which may either go directly into the fridge or into a boiling water bath for ten minutes). The other method uses pickling lime for crunchiness (I have less experience with the lime). Do you have a preference or recommendation for either choice? Thanks. About how long will these pickles last in the refrigerator? Thank you very much for the info. I stumbled across your podcast and am enjoying listening as I start learning about making sustainable, homegrown and homemade food choices. 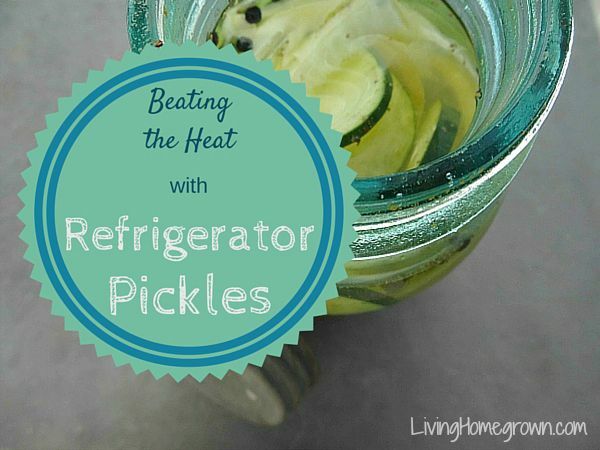 – does the brine need to completely cover the veggies in a refrigerator pickle? – if you run short on brine, what should you do? – and slightly different, my local store had “natural sea salt”. It’s non-iodized and has no caking agent (I checked), so that’s what I used – will it cloud up or is it like using pickling and kosher salt? I’m so glad you are enjoying the podcast. Okay – On the short brine. What you did was fine (adding vinegar is perfectly okay to do). This is what I do if I only need a few spoonfuls to top off a jar. However if you ever find that you need a cup or more of brine, I would mix up more brine from the recipe. That way, you keep the flavor you want and don’t make it more sour. If you don’t want to mix up a full batch with the spices, then just make up the important part of the brine which would in a typical recipe would be: vinegar, water, sugar, salt. Just omit the spices. Now, I’m sure you are thinking…”But I don’t want to mix up that much!”. No, you don’t. So just keep the ratios consistant and perhaps mix up half. (Cut all measurements in half). Or if you want to get fancy and do math, but everything into 1/4. But no matter what you do, keep the ratios exactly as the original recipe and you will be safe. The salt you picked sounds fine from a safety standpoint. And it should make a clear brine. It may have more minerals (which is healthy for you) and sometimes they can cloud a bit. But I think you will be okay. Yes the brine should cover the pickles. Hope that helps and enjoy the pickles!! I am loving your podcast and recipes. I tried your bread n butter refrigerator pickles as my first ever pickling attempt and they were a hit with everyone! I am only a biginner gardener so I didn’t have any cucumbers of my own. I used snacking cucumber from the shops instead and to my surprise they didn’t go mushy! But I have bought preserving cucumbers to grow at home. I’ll be planting them shortly (I’m in Australia so Summer’s just around the corner!) thanks! Oh I am so glad that you are having fun with it Ilaria. That is fantastic. I just found your pod cast & your blog/ website a week ago and I’m obsessed!!!! Thank You Thank you Thank you!!!! You have inspired me to try and recreate my grandmothers pickles I haven’t had since I was a little girl. Have you had any success in growing those little baby cucumbers for sweet gherkins? If so would you mind sharing what variety worked best for you for growing and a recipe?